Art: Lee Ferguson and Felipe Cunha. Cover: Jonathan Lau. New. Book FIRST PRINTING. New and unread. Sent in a comic bag with backing board as well as our usual protective packaging. New. Trade paperback (US). Glued binding. 272 p. Contains: Illustrations. 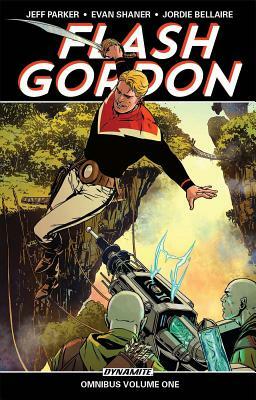 Flash Gordon Omnibus Tp, 1. Intended for a young adult/teenage audience. New. Flash Gordon never fit in on Earth. But on the bizarre planet Mongo, Flash's thirst for thrills and daring danger makes him the perfect weapon against the iron-fisted tyrant Ming the Merciless and his awful inter-planetary swarms of terror. Can the cocksure Man From Earth funnel his overconfidence into saving whole worlds? Num Pages: 272 pages, illustrations. BIC Classification: FL; FM; FXS. Category: (G) General (US: Trade). Dimension: 171 x 259 x 15. Weight in Grams: 662. 2015. 01st Edition. Paperback.....We ship daily from our Bookshop.